The Hartman history goes back to 1877, Wisconsin, USA, when trunkmaker Joseph S Hartmann cashed in on the railroad boom creating the iconic, Cushion Top in 1923, which held coat hangers in place, and later the Belting Leather bags, made from super strong leather. It was a lot more resistant to wear and tear. For sea voyages, they came up with the Seapack in 1939, crafted from flexible basswood due to the low availability of steel during the World War, that slowly evolved into the Skypack. They were recently bought over by Samsonite, which in turn falls under the Bag Zone brand, with other labels including American Tourister, Lavie and High Sierra and have thousands of different styles across innumerable stores worldwide. 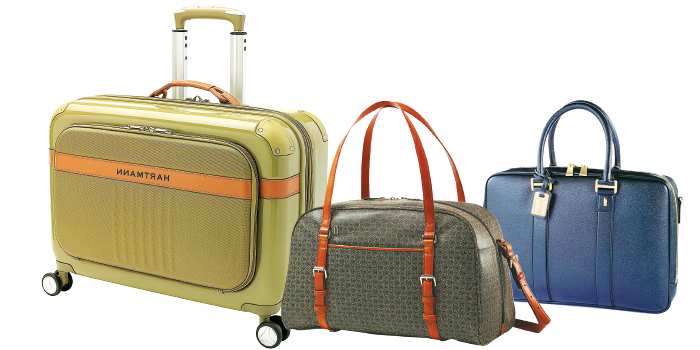 Stocked at the store are Esperto, Libero, Denovo, Classico Walker and Heritage collections with everything from carry-ons, briefcases, trunks, shoulder bags and even wallets. Of the carry-ons, the Denovo, a feminine, delicate hardside range in soft, milky white stands out. Crafted out of polycarbonate material and framed with leather trim, the metal rivets in gold around the edges give it a touch of glamour. The Classico Walker range is inspired by the essence of the Hartmann design, sporting the Hartmann monogram in dark chocolate and beige and is framed with a premium leather detailing, while the body is made from PVC, and is finished with golden zippers. For those with a fetish for vintage, we suggest the Heritage collection which includes the Tweed Belting range, that effectively combines American tweed with vegetable tanned leather. Water resistant, sturdy, durable and available in attractive designs, the walnut hued line is ideal for the in-style, frequent flyer. The Noviana shoulder bags add a bit of colour, with our pick being the powder blue number, featuring a unique silhouette, lock fastener, an elegant buckle and a grain leather make. Currently, available exclusively at UB City, they plan to launch their second outlet later this month in Mumbai.